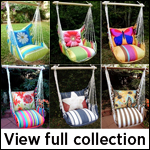 Whether you enjoy hibiscus flowers, henna art, birds or butterflies, this collection of chocolate striped swing chair hammocks are a great addition to any garden or outdoor area. With multiple designs to choose from, these brightly colored cushions are perfectly accentuated with striped colors of chocolate and white and create a wonderful burst of color to any outdoor area. The hammock chairs in this collection offer a sophisticated and stylish seating option when enjoying the outdoors, and can be used inside the home to transform any space into a fun area to enjoy. 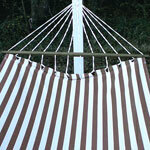 Each swing chair can support up to 250 pounds and easily hangs from a tree branch, porch or patio. A strong 33-inch Chilean pine wooden spreader bar evenly distributes the weight so you can have a pleasant experience with this specialized seating option. Fade, weather and mildew resistant, the comfortable polyester cushions are machine washable for convenience.